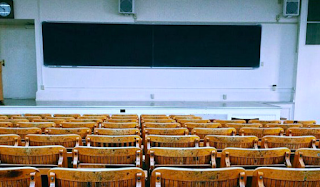 Some of you may be familiar with the concept of classroom circles. This idea is the brainchild of Restorative Justice and Restorative Practices in Classroom Management. In a nutshell, proactive circles provide the opportunity to head-off problems before they even start. Students get the opportunity to discuss concerns before they become problems. The circle is a safe space, where students can express themselves without judgment and the fear of retaliation. Now, I’m not going to lie to tell you and say that this process wasn’t a little painful at first. Teaching 7th graders to sit in a circle and talk about their feelings is a tall order. But just like anything new that you introduce in your classroom, consistency is key. It definitely took awhile, but it was well worth the time, effort, and patience. 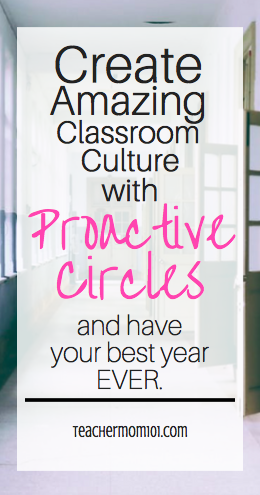 In my classroom, I implemented the proactive circle in the form of a weekly meeting that we call our “Monday Morning Meeting” (what’s an English class without a little alliteration?). We begin each week with a circle that occurs at the beginning of class. During this meeting, I outline our week’s schedule, talk about weekly learning goals, go over any important announcements, and discuss upcoming events (like impending testing, school wide events, etc.). The next thing that we do is set a weekly class goal. The students come up with these on their own. These include academic and behavioral goals. We also decide on a reward that they will receive if their goal is reached, and on Fridays if they achieve their goal, they get their reward. Typically, their rewards include board games, computer time, or special snacks. These goals not only encourage students to take stock in their learning, but they keep them motivated. After we set our weekly goal, we have “open floor time” where students have the opportunity to share. In order to do this in an orderly and respectful manner, I have a “talking stick” (a rain stick) with the rule that only the person with the stick may talk. This reminds students that when they do not have the stick, their job is to be a listener. During “open floor” time, students are allowed to talk about anything they want. Typically, they tell us about something that they did over the weekend, but they also can express concerns that they have about anything in the classroom. Early in the year in one of my classes, we were having a problem with some of the boys disrespecting the girls. They would yell “eww!” as they entered the classroom, and bark at them like dogs, and make generally disrespectful comments. I had spoken to a few of them several times, but it wasn’t until one of the girls felt brave enough to bring it up in the circle that it stopped. I think she had just had enough, and on that day she told the boys how it made her feel when they disrespected her. She told them that they made her feel like she was trash. The boys sat, mouths agape, in awe. I was a little afraid that we had crossed into something that was going to get out of hand, but the boys just sat there and listened. A few of the other girls spoke up, too, when it was their turn. The boys, in the end, apologized to the girls, and we all agreed that they needed to start being more respectful of their girls. They honestly thought that they were just playing around and they did not even realize how it was affecting the girls. They were truly sorry, and we have not had a problem since that day. We end our Monday Morning Meeting with compliments – after everyone shares whatever they want to share (or not, they can choose to pass the stick along without sharing), the stick is passed around again. Students must compliment the person who handed them the stick. At first, their compliments were really shallow and they said them quickly in order to get it over with. There was a lot of “I like your shoes.” After several weeks of practicing, and as the students started to really get to know one another better, their compliments started to get more substantial. Now they really think about their compliments and often compliment one another’s character more than their clothing or their hair. They have come a long way. We also have a celebration time in the circle where I recognize student accomplishment. We put stickers on our Achieve 3000 charts (a reading intervention program) for students who had high scores the week before, we acknowledge reading Lexile growth, and any other success that students are having in the classroom. We applaud the students, and they are really proud of themselves. I think this is my favorite part of the circle. As the teacher, my role in the circle is a facilitator, but also as a participant. I also share during “open floor” time and take the opportunity to tell my students things about my life. I tell them about my weekend, brag when my football team wins (go Penn State! ), and tell them about my family. Students squabble over who will get to sit next to me in the circle because they want me to be the one who has to compliment them. They like hearing my compliments. I always make sure to make them really substantial in order to model for them what a thoughtful compliment sounds like. The result of this process is a very positive classroom community. They applaud one another constantly. They are not afraid to share their thoughts or their answers to questions because they support one another. They don’t hassle each other if someone gets an answer wrong, or doesn’t know. They are helpful to one another. They look forward to my class – and not just because of the content, but because it is an open, caring, supportive environment – and they helped to make it that way! My students LOVE Monday Morning Meetings. They ask me as they come into the classroom on Mondays, “we’re having our meeting today, right?” They rely on that time each week. When we did not have our meeting this week because it was a very short week due to the Thanksgiving holiday, they were very upset with me. Very. Upset. First, be consistent. Pick a time and have your circle at that time every week, no exceptions. It will be difficult to teach students the procedures at first, and it can even be frustrating (especially when they just want to talk and not listen!). Be consistent. Remind them of circle expectations. Have a talking stick. Remind them of expectations again. And again. Remind them that their job is to be a listener. Second, have a routine. Choose a few things that you would like to accomplish during your circle time, and do those things every time, in the same order. Students will know what to expect after a few times, and the sense of routine will help to create security. Third – don’t be afraid to ask kids to leave the circle. If a student is being unruly, unsupportive, uncooperative, rude, or ugly – send them back to their desk. It only takes a time or two before they stop because they want to participate in the circle. They want to be a part of it. Tell them that the circle is a privilege and if they cannot handle it, they can sit quietly at their desk. In my experience, it doesn’t take long before they stop because they want to be a part of the circle. In my experience, the process is worth it. Do you think this will work with a Math 7th grade class? How much time you allow this Monday Meeting to last? I ask because in math there is so much content to learn. I want to do this, this fall 2018 but I am not sure about TIME.. do you think it is worth it? my classes will last close to an hour. I think this can work in any class, and I definitely recommend setting the tone at the begging of a school year. In other words, I would not try to start this mid- year. At first, the meetings will be longer as students learn how to participate in the curcle, but it's worth taking the time in the beginning. Once my students get the hang of the process, it usually lasts around 20 minutes. The time that it takes is worth it to me because it creates a very inclusive culture within the classroom and students learn how to respect one another, which makes class run smoother overall. The key is consistency, really. Same day each week, same time, same agenda. It takes a few weeks to establish those routines though, so be prepared for that time-wise! Good luck!